lower left in plate: Painted by W.J. Bennett. ; lower right in plate: Engd by W.J. Bennett. 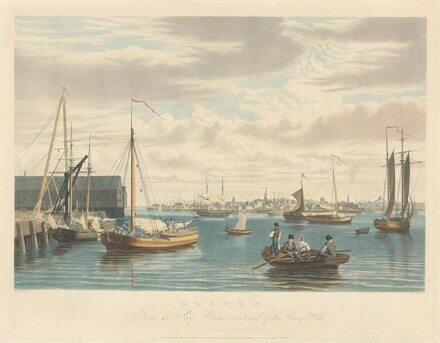 ; lower center in plate: BOSTON, / From the Ship House west end of the Navy Yard. / PUBLISHED BY H.I. ME GAREY,NEW YORK. / Entered according to the Act of Congress in the year 1833 by H.I.Megarey in the Cle rks Office of the district court ofthe southern district of New York.